The NWS runs an operational extratropical storm surge model called ET-SURGE (also known as ETSS). This model was developed by the NWS's Meteorological Development Laboratory (MDL) and is a variation on the NWS's Sea, Lake and Overland Surges from Hurricanes (SLOSH; Jelesnianski, Chen, and Shaffer, 1992) model which is used for hurricane storm surge forecasting. The ET-SURGE model runs operationally on NCEP's central computing system four times daily out to 96 hours producing numerical storm surge guidance for extratropical systems. The model is forced by real time output of winds and pressures from the NCEP Global Forecast System (GFS). 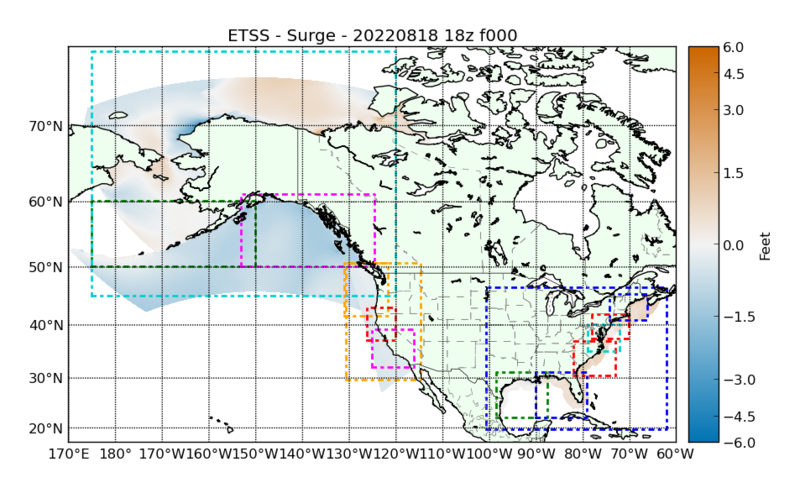 The current coverage of the operational ET-SURGE forecast domains around the U.S. is shown in the Figure. The availability of numerical guidance from the operational ET-SURGE enables NCEP (OPC and NHC/TAFB) to provide operational extratropical coastal storm surge guidance in the Marine Weather Discussion (MWD), also known as MIM, while more advanced and sophisticated coastal modeling systems are under development. NOAA information regarding storm surge terminology (pdf download). Jelesnianski, C. P., J. Chen, and W. A. Shaffer, 1992: SLOSH - Sea, Lake, and Overland Surges from Hurricanes. U.S. Department of Commerce, NOAA Tech. Report NWS 48, 71pp. The Extra-Tropical Storm Surge information shown here should not be used for tropical cyclone events. For official storm surge information associated with tropical cyclones, please consult advisories and warnings issued by the National Hurricane Center.